The Union Agri Minister Radha Mohan Singh has not been much in the news. His portfolio is agriculture. May be, the political transformation under Prime Minister Mr. Narendra Modi has been gogging headlines all the time that many of his ministerial colleagues don’t get noticed for what they have been doing. 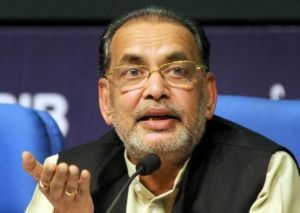 Mr.Radha Mohan Singh in a recent article that is published in a business daily (The Business line dated August 10 has given a summary of what his department has done so far. As far as the narration goes the agri ministry seems to have taken a great many initiatives. We can just briefly summarise the same where for the benefit of our readers. Almost some 20 odd schemes and initiatives the dept has taken. The narration runs like a science-based management of resources and sustainable production. Nation-wide soil health card scheme tries to protect the degrade soil etc. One related scheme is neem-coated ureas as mandatory. The other is nitrogen use efficiency. The third is the Pradhan Mantri Krishi Sinchavee Yojana (PMKSY). To ensure proper water use. The other very important scheme in our view too is the NEETI AAYOG designed Model Agricultural Land and leasing Act to make the interests of the land owners and the lease holders. We would say that perhaps this is the greatest change aimed at changing the very face of rural lives that are now marked by so many restrictive clauses in the many land leasing acts, Tenancy, Tenancy Recording, Land ceiling etc. As a result of the continuation of these acts that there is a standstill in agri investments and production and productivity levels. Almost there is a stagnation and even desertion of even productive lands by well-off tenants and their families to leave the villages and go for non-farming activities. Some states like Kerala, why even Tamil Nadu and much more the Karnataka state too have enacted acts to protect tenants that even if the tenant doesn’t pay rents they can’t be evicted from the land. Now, times have changed there are radical changes in the socio-economic and cultural areas, the younger generation rural youth, both boys and girls are educated and no youngster wants to remain in the villages and do agriculture. Even after the government resorted to crop loan write offs and also giving compensation for farmer’s suicides, we can see as in Maharashtra, one of the progressive and industrialised states, we see the unabated farmer’s suicide cases. Why, even in Punjab and other states we see the farmers ‘s distress reaching extreme levels. So, this one act by the Modi government has brought some realism in the thinking of the government. But then as in other areas too, Modi’s many promises don’t seem to take off. Now, there is much talk about the 2019 Lok Sabha elections there is very much scepticism whether any substantial land reform are possible. This is the one rub! The rest of the mantri’s narrative again reads like a bureaucratic notings. Yes, there are progress no doubt. Like the eMarket connecting the country’s 585 Mandis. So too connecting 22,000 rural markets. There is talk of promoting indigenous livestock etc. Fisheries is one growth area. All narration has a propaganda ring. What about the current major issues? Plantation sector is one such instance. Excess production of tea and milk. What about exports? International trade wars are looming on the sky. What is the role of agri exports? This may be the key for future agri progress of the country. No word! So too alternatives to the crop loan write-off and also crop insurance schemes. More premiums is collected than what the private insurance companies paid to farmers. Any radical step? Or, thought? We are rather disappointed by the mantri’s understanding of the crucial agri sector and there are many inter-connected issues like rural development, urbanisation and also the future of farming on the basis of anew radical thinking on relaxing land ownership so that new entrepreneurs enter this sector and invest and create new food processing industries. Agriculture sector under the Modi regime is a fixed bag. There are certain bold thoughts and policy initiatives. Also, there is much inaction that has led to their present agrarian distress.